"Where did you get that!?" Me: "On craigslist for only [insert awesome deal here]." "How do you find these great deals on craigslist!?" Well, I would like to share some tips for finding your own great deals, so if you think you might want to have some pre-loved treasures a la craigslist, read on. 1. Download an image preview plugin: This is SUPER important! There is no way you're going to be able to be persistent and really dig in to craigslist by clicking on every link to every title that sounds interesting. Nope. As I've said in the past, pictures sell so cruise through craigslist listings with an image plugin - I use this one. This plugin will show all of the pictures for each ad right below the ad title on the search results page. So. very. handy. 2. Be thorough with search words: The search engine craigslist uses is not very smart. That is, it only searches for the term you ask for. You're going to need to be specific and thorough. Be sure to search for both the singular and plural of a word (ie chair and chairs). If a person is selling a whole set of "chairs" they're willing to sell individually and you're only looking for "chair", you'll never see what cute chairs they have to offer you - sad! The same goes for similar words for the same thing (sofa/couch, nightstand/endtable, bookcase/shelves). Craigslist is only going to show you posts with the exact words you search for so use your imagination! 3. Find your seller: There are two types of sellers - savvy ones who know how great their item is and clueless ones who just need to clean our their garage. Not that I think you should take advantage of people, but the ones you're looking for are the clueless ones. (Geez, that sounds mean...) Finding clueless sellers has a lot to do with search words. If you search retro, vintage, mid century, shabby chic, antique, etc, you will find sellers who know they have a desirable vintage good. If you just stick to the basics, you're much more likely to find your steal. 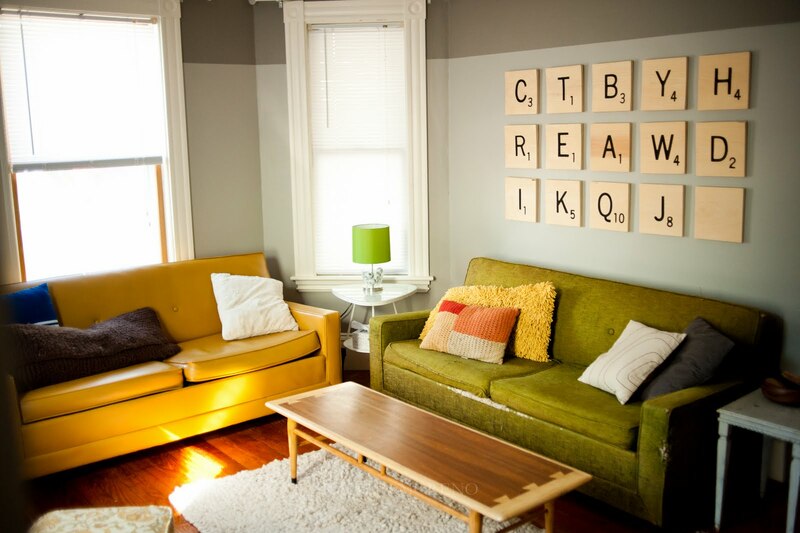 For example, I got the beautiful yellow mid century couch pictured below for $80. I did NOT search for mid century, vintage, or retro. I DID search for couch, couches, sofa, sofas, loveseat, love seat, and sectional. The lady was shocked Tim and I even wanted the couch and thought it was old, yellow, and ugly. She threw in the matching "ugly" chair for free. Score. 4. Be patient, but prepared to move fast! : Craigslist is not always the best resource when you need something right away. You may get lucky, but a lot of the best craigslist finds happen after days of searching. I found my new couch on the 5 consecutive day of looking and paid $300 - not a deal, but too cute to pass up. My $80 couch took about a month to find. Be ready to wait for the right deal for the perfect piece - your patience will be rewarded! ALSO, when you do find that piece, move move move! It's probably something someone else has fallen in love with too (or will shortly) and most sellers go by first come, first serve. Don't hesitate to write that email, be ready with cash and transportation, and make yourself available to fit into their schedule for a pickup. 5. Write a great email: 95% of craigslist sellers will make their email anonymously available through craigslist (the rest will leave phone numbers or will be businesses with a slew of contact info). You have to remember that a seller might be getting many emails of interest. When you write your email, be friendly, intelligent, and motivated and you are more likely to get a response. You can also check out my weekly Homeless Housewares blog for a glimpse of the type of treasures you can find on craigslist and how to reimagine them with DIY ideas. Awesome used furniture is out there people - happy hunting!! oh my goodness, I had no idea there was a CL photo preview extension for chrome! Thanks!! My sister just tipped me off to your blog and I freaking love it. Craigslist is my favourite thing, especially now that I live in Toronto and can scope out great finds like yours!